Warner’s due date was tough. Hard. Sad. I’m still not recovered from it. When one goes through grief it’s common to wonder if life will ever resume to normal. I’ve definitely wondered that lately as the last week has been a bit of a blur. On his due date, God was gracious and supplied me with many tangible gifts. My most personal and special one needs to finally be shared! It may seem silly and crazy and strange. But, isn’t that each of our personal relationships with the Lord anyways? On Warner’s due date, I took the girls outside to gaze at the sky, what felt the closest I could get to Heaven and our missing family member. 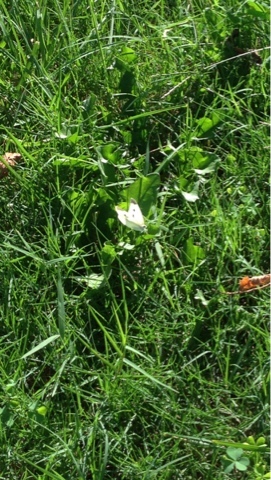 As we walked out, God gave me a white butterfly that danced with Charlotte in the backyard. It was honestly the most beautiful thing I’ve ever seen. I doubted the Lord’s gift (as I always do) and Googled to make sure that white butterflies even exist and that I didn’t imagine it. They do exist and a spattering of websites came up in the search claiming that they represent “a child’s soul or life”. I was awestruck and knew that God used even my moments of doubt at His gift to further show His grace on me that day. Since then I’ve been so sad that I never got a picture of it. I’ve wondered many times what it would’ve been like to have that picture. Well, today, we went outside to play after a rough grief week, and there it was. Another white butterfly. This time the butterfly danced with Ella and stayed a while. I chased the butterfly all around the yard. I snapped 50 pictures, not wanting our time together to end. I was even shoeless and the morning dew was still fresh on the ground. So, my feet were covered in grass, but still I chased. There’s never been a sweeter time of reckless abandon in my life. I chased that butterfly as though I was small child again and knew with that childlike faith that the butterfly was just for me. Even through my doubt, my failures, my grief, and my cynicism, God proves Himself faithful. He didn’t have to give me the white butterfly on August 20th. And, furthermore, He didn’t have to provide it again today so I could get a picture to remember this forever.